Ok, so I spoke yesterday. I think you will forgive me when you hear the circumstances. I had spent the morning recovering from the ridiculous night’s sleep. Then Dave and I drove up to meet a friend to test drive her van. We are thinking of selling Mama’s Purple Tar- the van that Nerissa and I have been driving to gigs. Amelia will be most disappointed if the deal goes through because we will be switching to a silver car. Amelia likes pink and purple and considers our maroon van- purple. Plus, like her parents, Amelia is a tad resistant to change. Then I went to pick Amelia up from school. I went early because of the snow. They hadn’t called to tell us that school was ending early, but I just thought the snow was coming down hard. It turns out that they HAD called us, but on the cell phone which does not work in my house.. All the kids were getting ready to leave when I arrived. I silently picked Amelia up and demanded that she change out of her sneakers back into her snow boots. Most people in my life feel the need to stop talking or even to whisper when they are around silent me, but not Amelia. She just talks and talks. She asks questions, but she doesn’t wait for the answer. It’s actually refreshing to hear a human voice. Plus I imagine that it entertains William. So we left school and William was sad. He wanted to be asleep. I put on Amelia’s Music Together tape and William was appeased. It is about an 8 minute drive home when there is no snow. We were driving pretty slowly, but we slowed down even more when I saw a car perpendicular to the road having crashed into a parked car. We were about a mile and a half from home and I was going between 15 and 20 mph when my car started to skid. It was all in slow motion. I had absolutely no control. The car slowly crossed the oncoming lane, crashed into the bank on the other side and turned around so that I was facing away from my home, but with the traffic. Thank God, no cars were coming at the time. William started to cry. Amelia was quiet. I pulled off the road into a driveway. That was when Amelia started to bawl. So I talked. Wouldn’ t you have talked too? I told her we were fine. I called Dave and he came down the hill. I was shaking like a leaf. I got out of the car to check on William. I was worried that I needed to take him to the ER. I drove back to the gas station that we had just passed and William, Amelia and I sat in the back of our van where there is no seat, just an expanse of flat space where our music gear usually goes. As soon as I took William out of his car seat he was happy as a clam. I think he was just annoyed at being woken up. Dave arrived a minute later and we all realized it was silly that he had come down. We were all okay. My bumper had done what it needed to do. It was cracked but the car was okay. Most importantly the car seats had done their job and my children were fine. So my brief visit back to speaking world was not exactly worth it, but in all that trauma I think I noticed that it was a little less hoarse. I’ve now gotta bring Amelia to her aunt Nerissa’s house for a fun filled day. Amelia literally squealed with delight when her Daddy told her what she was doing today. “The WHOLE day? I get to play with Nerissa for the WHOLE DAY??!!? ?” So much joy her aunt brings to her. Sorry to hear about your little “adventure” on the road. But I’m glad that you, Amelia, and William are OK. Also glad to hear that your voice was a little less hoarse. You mentioned in your last blog that you were looking for some new music to listen to during your silence. 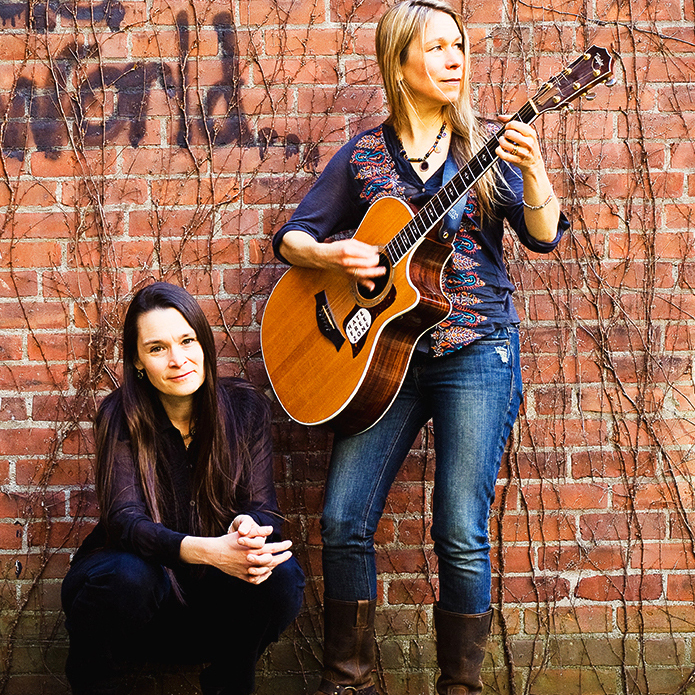 I recommend the Ennis Sisters, a Canadian trio that sings pop, country, folk, and Celtic. What a harrowing experience! That’s one of my biggest fears – getting in a car accident with my daugter in the car. Thank heaven there was no opposing traffic, and that you and your kids are ok.
Take care. Hopefully spring will finally arrive and put an end to all this snow! Of course you had to talk! I am sure Amelia felt much better after hearing your voice. Glad to hear you and the kiddos came through it unscathed. Thanks for the daily updates–they are fun to read at a not-so-fun job. I hope Amelia had a wonderful day with Nerissa and that my buddy Cody did not bark too loudly. So many scary incidents, so many dangers in life. Katryna, you’re helping all your fans and friends to take better care of ourselves and each other. That’s the blessing in your saga of difficult times. I appreciate you’re willingness and ability to share. I listen to your voice almost every day, so you’re still being heard, if only by electronics. Can’t wait to hear you out loud and in person. A voice like yours should never, ever be stilled. it’s a national treasure. I’m glad you’re taking care of it. Sending lots of healing energy your way.